Law enforcement, like much of American society, is still trying to come to terms with all the events and innovations of the last 17 years. And perhaps no other aspect of law enforcement has seen more change since the dawn of this century than SWAT. Lt. Joe Dietrich of the Maricopa County (AZ) Sheriff's Office (MCSO) has been a witness and a participant in the last two decades of SWAT evolution. Dietrich began his tactical law enforcement career in 2001 and has spent nine years on the MCSO team, rising from deputy to sergeant. (Now that he is a lieutenant, he's been reassigned, but he wants to go back.) "There were a lot of changes on the team from the first time I was on it to when I was a sergeant and even in the last two years," he says. Dietrich can tick off a list of changes he has experienced in SWAT operations. So can Thor Eells, a 30-year veteran of the Colorado Springs (CO) Police Department and the new executive director of the National Tactical Officers Association (NTOA). Eells says equipment, tactics, and technology are obvious changes in SWAT, but there have been much more subtle developments in SWAT philosophy, especially in terms of training and standards. "What we've tried to do at NTOA is to provide a better definition of what constitutes a SWAT team," he explains. Because there are thousands of law enforcement agencies in the United States, all with different standards, the definition of SWAT training can be subject to local interpretation. In a few states, SWAT standards are set by a POST board or a similar certification body, but those states are the exception, not the rule. Eells, who spent much of his career on the Colorado Springs PD's Specialized Enforcement Division (SWAT in all but name), would like to see that change. "There is a need for more professionalization in this law enforcement sub-specialty," he says. "As SWAT officers, we have a responsibility to the American public to do what we do very well." For SWAT to achieve that level of excellence and professionalism, Eells believes administrators have to step up. "Administrators have a responsibility to ensure that we provide SWAT officers with the right training, the right tactics, the right technology, the right equipment, and the right leadership," he says. Agencies providing the right equipment for SWAT operations is critical for officer safety. And as we move toward the third decade of the 21st century, the quality of the equipment available to tactical officers is improving significantly and that has led to better outcomes for officers, hostages, and even subjects. Eells says one of the greatest advances in SWAT officer safety has been the development of new body armor technology for both soft tactical armor and hard armor plates. "It's much lighter, much more flexible, and provides more protection and more coverage. Operators can move and function much better in the new armor," he says. Weapon selection both lethal and non-lethal has also led to better outcomes for tactical operations, according to Eells. "Weaponry has changed. We've seen some improvement in lethal weapons, but the real advances have been in less-lethal weapons," he says, citing better integration of less-lethal impact munitions and TASERs into SWAT operations as a change that is leading to better outcomes. But perhaps the change in SWAT equipment that has led to the greatest increase in officer safety is the widespread use of a variety of robots. MCSO's Dietrich says that up until about 10 years ago SWAT robots tended to be really expensive, very large, and cumbersome to operate. He believes the development of smaller robots such as the iRobot Packbot and the Recon Robotics ReconScout have been a boon to SWAT operations. "You can even throw some of them into a house through a window. That gives us eyes in the house, and that is tremendously helpful. Now we can wait and let the robot start working before we take action." Tools like easier-to-use robots have also led to changes in SWAT tactics. Dietrich says his team uses a variety of tactics to reduce the chance of bad outcomes when serving warrants, including sending in the robot. "When serving a drug warrant, it wasn't uncommon for us to hit a structure fast to basically save dope (as evidence)," Dietrich says, adding that practice changed because people were getting hurt. MCSO now uses time, distance, and cover to mitigate the hazards of serving warrants. "We breach and hold. We contain and call out. It's a lot safer for the team," Dietrich says. And before MCSO SWAT moves on a subject in a house, they first send in a robot or a K-9. "If they refuse to come out after we call them out, then we treat it as a barricade and use barricade resolution tactics." Another big tactical change for MCSO SWAT was not precipitated by technology but by concerns about liability and by legal ruling. Dietrich says in the last two years the agency has ceased rolling SWAT out on barricaded suicidal subjects with a gun or knife where the subjects are not threatening to harm anyone but themselves. "We're not the only ones," Dietrich says. "Two years after we adopted this policy there are probably not any teams in the [Phoenix area] responding to those types of calls." Before this policy went into effect two years ago, half of MCSO's callouts involving barricades were suicidal subjects. "Now we ask patrol two questions: Is he in there by himself? Is he a danger to anyone other than himself?" Dietrich says, adding that the patrol deputies have also been trained in this policy. There are, of course, conditions where MCSO SWAT will respond to suicidal subjects, such as a subject loading a rifle mag to shoot himself. "If that's the case, then we have to think he may be planning something more than shooting himself," Dietrich says. He adds there are still times when a few members of the tactical team roll on a suicide call in case "something goes exigent." Just as MCSO SWAT educates patrol officers on the law and potential legal and physical dangers of intervening in a suicide where a subject is not breaking the law, the team also trains first responders in active shooter response. This has become a common role for SWAT on many agencies, according to NTOA's Eells. "SWAT officers have the most experience and best training with these types of tactics, so I think it is a wise, wise move to have them train first responders on active shooter response. Patrol officers are there for the first five to 10 minutes of these incidents, so their ability to handle that well has a direct impact on the outcome as to whether lives are saved or lost," Eells says. MCSO SWAT has been training the agency's first responders in active shooter response since right after Columbine, Dietrich says. This educational role has now been formalized with the SWAT team training recruits in the academy. The 10-hour training includes classroom presentation, instruction on tactics, and then scenario-based training that may involve as many as 50 role players. "We make it as real as possible," Dietrich says. MCSO's educational role also includes interfacing with the public about concerns over police "militarization." Dietrich says his team does public demonstrations of its equipment to show people why they need it to safely do their jobs. "We show them how important our armored vehicles are for officer and public safety," he says, adding that he likes to show skeptical members of the community the bullet holes in the armored vehicles and explain to them that those bullets were meant to kill officers or the people they were protecting. Eells says countering claims of "militarization" is critical for the future of police tactical operations, especially as agencies face shrinking or stagnant budgets and reductions in federal grant programs for SWAT equipment. He sees the Department of Defense's 10-33 military surplus for law enforcement as essential to helping agencies maintain SWAT readiness. Equipment funding is not the only shortage that many agencies are facing. Law enforcement agencies nationwide are having trouble filling their ranks in the post-Ferguson anti-police environment and that will have an impact on SWAT preparedness and usage. Eells says he is concerned that some agencies rather than fielding dedicated crowd control units are relying on SWAT for that duty as a way of saving money and that should not be the role of tactical officers during a protest. He believes this is one of the reasons why police militarization became such a concern with activists and politicians during the Ferguson demonstrations and riots. "I think what happened here in the United States is that we went so many years without large-scale civil unrest that many agencies decided training and equipping crowd control teams was unnecessary," Eells explains. The result of that thinking he says is that SWAT was forced to fill the void. "You had tactical teams put into the role of managing civil unrest, which they do have some training for, but SWAT is not the best tool for crowd management." Eells believes the presence of SWAT at demonstrations led to the "misrepresentation" to the American public that police were becoming too "militarized." Because of officer shortages going forward, agencies will have to be very aware of the visuals of sending a SWAT team into a demonstration, according to Eells. "There has to be a balance," he says. "I think that's something law enforcement administrators and tactical team commanders have been trying to find, that right balance of being prepared and yet not appearing overly aggressive." As anyone in SWAT operations will say, even though tactical teams are equipped for close-quarter battle, they rarely have to engage suspects in combat. The goal is to have the tools to prevent that. And one of the best ways to prevent officer, hostage, or even suspect injuries and deaths is to ensure the team and its commanders have improved situational awareness. That means technology and the people who know how to make the most of it. Dietrich says when he was team leader he was always looking for the tech-savvy officer. On MCSO, that officer tends to be an explosive ordnance disposal (EOD) specialist. He explains that EOD officers roll with the SWAT team for explosive breaching and bomb tech duties. Eells says MCSO is not alone in its approach. He says the Colorado Springs tactical team works with technologically adept officers that handle robots and computers during its callouts. "We are starting to see more of this," he says. "Cutting-edge agencies are recognizing that technological advantages can be leveraged to resolve incidents through intelligence gathering and situational awareness." The future will bring more situational awareness assets for SWAT. 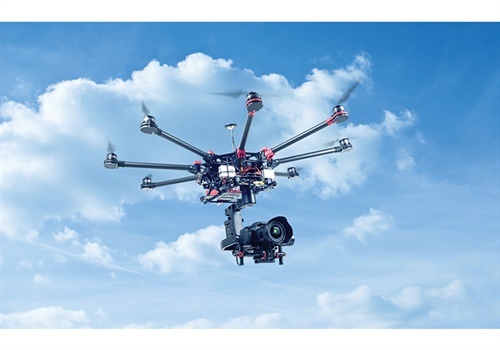 Currently, incident commanders and team commanders have video streams from body-worn cameras, robots, and other cameras deployed in the field, but soon video from unmanned aerial vehicles will be adding to the intel-gathering capabilities of law enforcement. "At the MCSO we are in the process of writing a policy on drones," says Dietrich. He says drones will provide major benefits for SWAT teams, especially during barricade situations. "You can see what's in the backyard and what's happening in real time. Backyards often have things like trailers, boats, vehicles, that suspects can use to hide in. Having eyes in the sky to watch over that will help tremendously. I'm looking forward to having those capabilities."